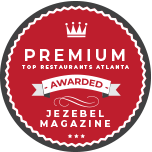 Enjoy an unforgettable meal at the hottest steakhouse in Atlanta. Cuts serves up irresistible short ribs, succulent steaks in Atlanta, and southern classics — such as shrimp and grits and fried lobster tail — along with an excellent selection of wines, beers, and cocktails. 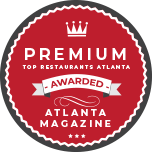 Contact us at 404.525.3399, make a reservation, and discover a steakhouse that is truly a cut above the rest. Cuts is a Southern-style steakhouse and bar located in the heart of Atlanta's downtown dining district, just a short walk from the many of the city's top hotels and convention centers. We offer a fine dining experience with full table service in a business-casual setting. Guests can choose among our main dining areas, semi-private rooms, or comfortable ground-floor patio. There's plenty of parking nearby, and we have cutting-edge AV equipment for sports and special events. Whether you want an intimate meal in front of the fireplace or you want to watch the game with your friends while enjoying great drinks and appetizers, Cuts is the perfect venue. We can also host your next business meeting or event. With more than 20 years of experience in the restaurant industry, we know how to deliver great food and impeccable hospitality to every guest.